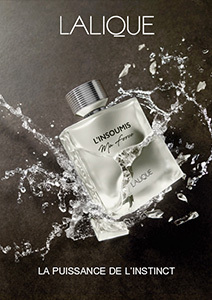 The Noir Premier Collection highlights the milestones of Lalique history with contemporary fragrances whose names and themes are inspired by a legacy full of boldness and modernity. These scents, made of peerless ingredients, reveal novel facets of timelessly beautiful olfactory families. A bold balance of the abstract and the figurative, the bottle holding these fragrances was inspired by two of René Lalique’s iconic designs. As diaphanous as the wings of a dragonfly, as sensual as the cruves of a woman's body, ILLUSION CAPTIVE offers a shimmering olfactory translation of the masterpiece that inspired it. OR INTEMPOREL is a spicy oriental fragrance in which the two deliciously addictive main notes, tobacco and coffee, are used to evoke the opulence of gold. ÉLÉGANCE ANIMALE is a potent and sensual woody oriental fragrance combining leathery, fruity and floral notes in perfect harmony. 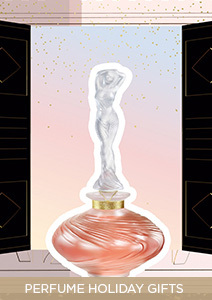 ROSE ROYALE enhances the fruity facets of rose absolute by supplementing them with peach and osmanthus. TERRES AROMATIQUES is a garrigue scented fragrance that complements the most iconic plant to come from the Midi: thyme, enhanced with lavandin.